This Fool read one of Peter Lynch's books and picked up some simple advice that helped him cruise through our nation's deepest recession. He used what he knew -- the automotive industry -- in a strategy you could use again. Today, I'm able to pat myself on the back and say "job well done": I played the automotive industry and the market like a fiddle. It all started years ago in the midst of the nastiest recession our nation has faced. Years ago, where my story begins, I read Peter Lynch's book One Up On Wall Street, from which I picked up some great -- yet simple -- investing knowledge. Here's the good news for investors: What I did is one of many strategies that can and will work again. Rather than pull my money out at the wrong time, as so many people did, I invested in specific trend-bucking, low-beta stocks -- O'Reilly (NASDAQ:ORLY), Advance Auto Parts (NYSE:AAP), and AutoZone (NYSE:AZO). I did so while following Lynch's advice to "invest in what you know." To allow me to tell my story, let me briefly explain what the beta number is and how it works. Then I'll tell you why I picked those stocks and explain how you can do it next time. In case someone out there can learn from me today, here's how a stock's beta number works. You can find the number listed on any ticker profile page. If the number is less than 0, the stock generally moves in the opposite direction as the market index -- gold, for example. If the number is equal to 0, the stock movement is uncorrelated to the market. If the number is greater than 0, but less than 1, the stock's movement is generally the same direction as the market index but to a lesser degree. If the number is equal to 1, its movement is generally the same as the market and to the same degree. If the number is greater than 1, it moves in the same direction but to a higher degree. While I never recommend trying to time the market -- ever -- you can help protect your portfolio by moving some assets into low-beta stocks during downturns. When things begin to improve, move some assets into higher-beta stocks. This is where my story begins. When the financial crisis occurred and the stock market began to tank as we entered into a severe recession, I searched for low-beta stocks that I knew and was confident in. I began my marketing career in the automotive industry and knew it thoroughly. I knew that during a recession, consumers put off large vehicle purchases and repairs -- opting to do the repairs themselves. This consumer mind-set to save a buck on an oil change and other small repairs was a boon to automotive retailers such as O'Reilly, Advance Auto Parts, and AutoZone. Their beta numbers are low at 0.40, 0.49, 0.20, respectively, and I pulled the trigger to move some of my assets into those three stocks. During the recession and following months, store traffic increased and company profits surged -- which made these stocks rare winners at the time. If that one move was all I had done, it would have been a great move -- and those three are still doing well. Since I still follow and understand the automotive industry for a living, I saw the rebound potential that Ford (NYSE:F) represented last year. Ford has a much higher beta number at 1.56, and I finally had enough confidence in our economy's momentum to invest in high-beta stocks. During one of Ford's famous "summer swoons," I took advantage of what I thought was an undervalued stock and pushed some of my assets into it. 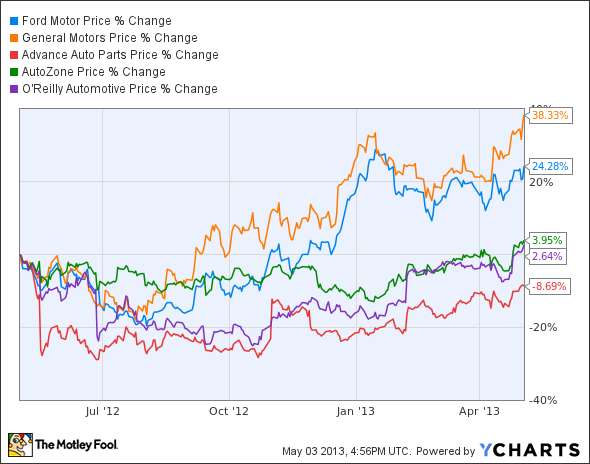 It's been a great move so far, and I see tons of potential left in Ford and its rival General Motors (NYSE:GM). Ford escaped a bailout because of excellent vision and management from industry-leading CEO Alan Mulally. Ford's crosstown rivals weren't so lucky and would suffer through bankruptcy and a government bailout. The lessons Detroit's Big Three would learn from their worst chapter in history would be vital to their becoming valid investments once again -- and they have. As the economy improves, we're seeing U.S. vehicle sales increase to levels not seen since before the recession hit. Detroit's Big Three have emerged from the recession much leaner, efficient, and, most importantly -- profitable. Now both Ford and GM are producing valuable, fuel-efficient, quality vehicles that people actually want to buy. That was evident these past two weeks, as both companies posted beats on first-quarter earnings and are optimistic for the future. Just recently I felt comfortable enough to put some of my hard-earned cash into GM, and I'm hoping my story continues to be my best investing decision. If you follow Lynch's simple advice and invest in what you know, that alone will make you a better investor. You can also protect your portfolio by having some low-beta stocks during uncertain times. Did any of you have investment wins during the recession? I'm curious to hear about other stocks that may have done well. Let me know in the comments below.